We are pleased to offer case pricing to churches and other likeminded organizations at $12.50 per book plus shipping; in cases of 26 books. Interested parties, please email marc@bibletimespublishing.com or call (805) 985-7832. 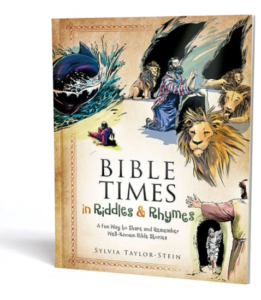 Want Sylvia Taylor-Stein to Speak at Your Church or Event? Author Sylvia Taylor-Stein still has a few openings in her 2019 schedule. She is an inspiring speaker with a great testimony and loves to share God’s Word in riddles and rhymes. If you want Sylvia to speak at your church or event for free, please email us with details (i.e. where, when, who, etc.) to marc@bibletimespublishing.com. Sylvia will be speaking at at the Legacy Coalition’s Grandparent’s Summit, February 21, 2019, in Fullerton, CA.